In 2015, after apparently being groomed online, Tower Hamlets schoolgirls Amira Abase, Kadiza Sultana and Shamima Begum left London on a plane to Turkey, with the aim of joining the organisation then referred to as the ‘Islamic State in Iraq and the Levant’ (ISIL). Four years on, Kadiza Sultana is dead and it is unclear what has happened to Amira Abase. Shamima Begum is in a UN refugee camp in eastern Syria, from where she has been attempting to get home to Britain; since travelling to Syria she has given birth to three children, all of whom have died, the latest in March 2019. Since Times journalist Anthony Loyd visited the camp in February 2019 and published a provocative interview with Shamima, she has been at the centre of a media and political controversy. NICKI JAMESON reports. In December 2018 the government published its White Paper, ‘The UK’s future skills-based immigration system’, setting out how the British state will manage its racist immigration system after exiting the European Union. The proposals mainly consist of subjecting EU migrants to the same restrictive immigration controls as current non-EU migrants and will be phased in over the Implementation Period, which is due to end on 31 December 2020. The Home Office’s racist ‘hostile environment’ continues to take its toll on immigrant children in Britain. Those with complex immigration issues are regularly receiving insufficient care from local authorities. Councils across the country are failing to take action quickly enough to provide support to young immigrants, or failing to identify them altogether. Many of those fortunate enough to even receive care have been left isolated by a conveyor belt of new social workers. The British state is intensifying its attacks on vulnerable immigrants and asylum seekers. Benjamin White reports. ‘…the United Nations refugee agency UNHCR estimates that there are currently 68.5 million “forcibly displaced people” in the world – the highest number it has ever recorded.’ Britain has 122,000 refugees – a tiny proportion of the world’s total. On 21 September Zionists in Camden attempted to stop a public meeting called by FRFI in support of the Palestinian struggle. Using the newly-accepted IHRA definition of anti-Semitism, the Zionists persuaded the King’s Cross Brunswick Neighbourhood Association, who manage the hall on behalf of Camden Labour Council, that the meeting would be anti-Semitic. Widespread support for FRFI’s right to hold the meeting stopped the Zionists in their tracks (see Victory in fight against censorship of our London meeting on Palestine), but attempts to sabotage and intimidate the meeting did not stop there. Camden Council sent Prevent spies to the meeting to gather information and to monitor for anti-Semitism. The Windrush Taskforce set up to ‘do right by’ the Windrush Generation is routinely missing its target of processing applications within two weeks, with some remaining unresolved after two months. The number exceeding this limit rose from 3% in May to 16% in June. The first outright refusals by the Taskforce are being issued. Any potential compensation has been delayed until at least October, and the scheme is dogged by the scandalous requirement for its applicants to sign non-disclosure agreements. Meanwhile, the estimated number of those affected continues to rise, and there is no prospect of an interim hardship fund. The wheels of justice move slowly, if at all, for the targets of Britain’s racist state. Séamus Padraic reports. There are about fifty 'hard-core' picketers who spend most of their time on the picket, the majority of them youth. A typical day sees about a hundred people joining and leaving the picket and overnight anything between five and twenty-five people sleeping on the picket. Enthusiastic political work goes on almost constantly, leafleting, petitioning and explaining to passers-by, unison singing of South African freedom songs and spirited chanting of militant slogans. The summer of 2018 saw a rise in the activity of the far right in Britain. A number of high-profile street demonstrations in London by the far-right Democratic Football Lads Alliance (D-FLA) were organised in support of English Defence League co-founder Stephen Yaxley-Lennon (aka ‘Tommy Robinson’) and attended by thousands. This and other far-right events around the country have prompted calls to reboot the Anti-Nazi League (ANL), an anti-fascist movement formed by the Socialist Workers Party (SWP) in 1977. However, just like the original ANL, the mainstream anti-fascist groups’ strategy is to seek unity with the Labour Party and trade unions whose support for racist immigration controls and policing has not changed under Jeremy Corbyn’s leadership. Re-forming the ANL has been endorsed by Shadow Chancellor John McDonnell, a key ally of Corbyn, and a ‘National unity demo against racism and fascism’ has been organised for 17 November. This festival of respectable anti-fascism will do nothing to challenge the chief perpetrator of racist violence, the British state. WILL HARNEY reports. Fighting Racism: Which way are we marching? There is an urgent need for serious discussion about the tactics of today's anti-fascist movement. MAXINE WILLIAMS analyses aspects of the history of the anti-racist and anti-fascist movements in Britain. Two months after the Windrush scandal broke, over 2,000 people have been issued documentation allowing them to stay in Britain and over 500 more have been granted citizenship. However, only a quarter of those identified as potentially having been illegally deported have been contacted by the Home Office, while many other Windrush citizens remain, destitute, out of work or continue to be denied healthcare. Compensation is currently nowhere in sight, and politicians across the board continue to use the Windrush affair to reinforce the distinction between Windrush citizens who deserve justice, and ‘illegal immigrants’ who do not. Seamus Padraic reports. On the nights of 3-5 July, the flames of revolutionary rebellion lit up the streets of Liverpool 8. Then on 7-9 July they spread to Moss Side Manchester. Hundreds of black and white youth united in common hatred of their oppressor, the British state, engaged in fierce battles against the racist police. After hours-long pitched battles, and to the terror of the ruling class, the youths drove the police out of Liverpool 8. Liverpool 8 became a no-go area for the forces of British imperialism. In Moss Side Manchester, hundreds of working class youth laid siege, two nights running, on Moss Side police station. In the heartland of British imperialism, we are witnessing the emergence of a truly revolutionary working class movement. The RCG alone in seeing in black youth the vanguard forces of the British revolution has again been proved correct. The corrupt and imperialist Labour Party and its middle class allies with their peaceful constitutionalism belong to the past. The future of the communist movement in Britain is with the forces of St Paul's and of Brixton, of Southall and of Liverpool 8 and Manchester — the forces of revolution. No more charter flight deportations! Every two months or so the British government rounds up about 50 Nigerians, Ghanaians, Liberians and Sierra Leoneans for deportation on specially chartered flights to Nigeria. The proposed passengers for these secretive charter flights are brutally dragged away in the middle of the night, shackled with three guards per person and their phones seized; the unlucky ones are deported hours later. One migrant worker targeted in January 2018 was Kenneth Oranyendu, a father of four children, aged five, six, eight and 17; all are British citizens. In 2005-2007 Manchester RCG successfully helped Ken’s wife and son, Eucharia and Timeyi, fight deportation to Nigeria (FRFI 200, December 2007/January 2008). Charles Chinweizu spoke to Ken on behalf of FRFI about his current situation. Although information about the Home Office’s treatment of long-standing Commonwealth nationals living in Britain had already been trickling into the media, on 16 April the ‘Windrush Scandal’ catapulted to the top of the news. A day earlier, Downing Street had refused a formal diplomatic request made at the meeting of the Commonwealth heads of government to discuss the situation. In response, 140 MPs signed a cross-party letter to the Prime Minister demanding she find a ‘swift resolution’, and Labour’s David Lammy spoke in Parliament of ‘a day of national shame’. Séamus Padraic reports. The Windrush scandal is now being appropriated by the media and all political parties and commentators as a one-off story to divert protest away from the reality of British state racism. It is being used as a cover for the historical abuse of migrants. There is an urgent need to understand what is happening to migrant labour today and just as importantly, the historical roots of British state racism. The 492 men, women and children on board the Empire Windrush that docked at Tilbury on 22 June 1948, arriving from the British Colony of Jamaica, did not expect to face a hostile reception. They came to Britain because they had been invited by British government departments and ministries to migrate to ‘the mother country’ and they disembarked as British Citizens. Like the vast majority of British Citizens, they did not hold passports but had been recruited to work and many already had jobs to go to. Susan Davidson reviews the history of the treatment of migrants by Britain’s racist state. Ali was snatched from Colnbrook Immigration Removal Centre at around 5pm. His phone was taken away by guards, so he could not mobilise his supporters. The Home Office purposefully carried out the abduction on a Sunday, when they knew solicitors would be hard to reach. On Friday 4 May activists from the Revolutionary Communist Group, Goldsmiths College Anti-Imperialist Society and others mobilised in support of Somali refugee Ali Nur in order to stop his deportation to Tanzania. Ali has lived in England since 1998, when he fled the Somali civil war in which his family were slaughtered. He has built a new life here and has three British-born children. Since 2015, Ali had seen very little progress on his Home Office case, trying everything to improve the situation, getting stuck between an uninterested solicitor and frustration created by the Home Office. For the last eight years he has reported weekly at the west London immigration reporting centre Eaton House without missing a single appointment. Then on 23 April 2018, when he went to report as normal, he was detained and told he was going to be deported. He was taken from the reporting centre to Colnbrook IRC, an immigration prison next to Heathrow airport. As the Israeli state expels thousands of African migrants, prepares to annex the West Bank, and talks up war on Hezbollah and Iran, it should be unthinkable for any anti-racist organisation to offer any concession to Zionism or the Zionist state. The charge that anti-Zionism equals anti-Semitism has been used by supporters of Israel to vilify supporters of Palestinian freedom inside and outside the Labour Party. Yet on 17 March, the Socialist Workers Party (SWP), through its Stand up to Racism (SUTR) front was prepared to allow an avowedly Zionist and pro-Israeli organisation to join its annual march against racism in Glasgow. More than that: it had faced down pro-Palestinian supporters when they demanded that the organisation in question, the Confederation of Friends of Israel – Scotland (CoFIS) be excluded from the event. In the end, the Zionists were prevented from joining the march because of a counter-mobilisation led by Glasgow Revolutionary Communist Group. 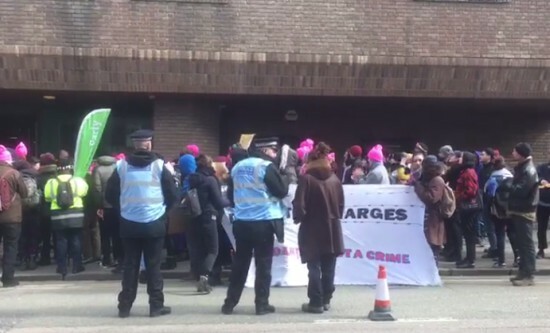 On 19 March 2018, the trial began of 15 anti-deportation activists from End Deportations, Plane Stupid, and Lesbians and Gays Support the Migrants, who on 28 March 2017 prevented a charter flight to Nigeria from Stansted airport in Essex. On 24 March the trial was adjourned until further notice. The 15 are charged with aggravated trespass under the Criminal Justice and Public Order Act 1994, and 'obstructing or disrupting ... Stansted Airport' under the Aviation and Maritime Security Act 1990, brought in following the 1988 Lockerbie bombing ostensibly to target terrorist activity. The maximum sentence they could face if convicted is life imprisonment. Ironically, the British government's intention is to terrorise activists. The black people of St Pauls drove the racist police off the streets! They have achieved a glorious victory for all oppressed people and the whole working class! For four hours on Wednesday 2 April St Pauls was a ‘no-go' area for the British state. The sight of black people taking the offensive to defeat the police is a terrifying prospect for the imperialists. The revolutionary movement of black people is striking blows right to the heart of the British imperialist monster. The British state is counterattacking in an attempt to crush the resistance of black people. Fight Racism! Fight Imperialism! salutes the tremendous victory in St Pauls and calls for full support for the defence of those arrested. The police raid on the Black and White Cafe was one of many raids on black meeting places in Bristol. A few weeks earlier the blues on Brook Lane had been closed down by the police. When the police came to the Black and White at 2.30pm on Wednesday 2 April they were mounting yet another attack on the black community. The police came prepared for resistance. Apart from the twelve police making the raid, five dogs were used and a back-up force of over thirty police were waiting nearby. The police met more resistance then they could contain. Resistance from angry black people who have had enough of racist harassment and brutality from the police. Decent housing for asylum seekers! Decent housing for all! Jomast hear us say! Over-crowding no way! Bedbugs, broken cookers, leaking ceilings, black mould – enough is enough! Protesters picketed Jomast’s Middlesbrough offices on Monday 5 March, rallying against the luxury property developer’s sub-standard accommodation provisions for asylum seekers. Tyneside based Migration Asylum Justice Forum, supported by Fight Racism Fight Imperialism North East, coordinated with South Yorkshire Migration Asylum Action Group and North East Coalition for Asylum and Refugee Rights to demand improvements for asylum accommodation calling for an end to forced bedroom sharing which sees unrelated strangers forced to share bedrooms. The Asian Youth Movement Bradford has taken a major initiative in calling the Black Freedom March from Bradford to London, in June and July this year. We print their statement in full in this issue [below]. Fight Racism! Fight Imperialism! pledges its full and unconditional support to this march. We urge all our readers and supporters to do likewise. This march is an extremely important step in the fight against racism in Britain. The racist thugs of Holloway Police Station have beaten up yet another black youth. Their latest victim, Junior Archer, like the Earlington family, has decided to fight the case. He has asked the Earlington Family Defence Committee to take it up. Junior Archer is 18, he lives in Hornsey. On Thursday evening (6 March) he went out to a club. On his way home in the early hours of Friday morning he was stopped on Tollington Way by four police. There were two other people with Junior but he was caught first, and surrounded. He stood there, he didn't move, he didn't push to get free, he didn't say anything. Immediately, seven other police arrived in a van. The brutality started right away when the police tried to get information out of Junior about the people with him. Amid the continuing controversy about the Notting Hill Carnival, communists everywhere remember with special affection the inspiring, at times lonely, struggles of a great communist woman, Claudia Jones, born in Trinidad in 1915, who died in London 1984. SUSAN DAVIDSON reports. In 1924 Claudia’s family left impoverished Trinidad to make their lives in Harlem, New York. They were among the millions of black people who fled to the Northern cities of the USA after the First World War to escape poverty and Southern racism. As a young woman of 17 years, Claudia, seeing the poverty, exploitation and racism surrounding her, determined ‘to develop an understanding of the sufferings of my people and my class and look for a way forward to end them’. She never flinched or changed from this commitment to understand and to act and devoted her life to this task. On the Black Peoples Day of Action, Central London witnessed a clear display of the hatred and anger felt by black working class people for the 'National Front in police uniform', the racist organisations and the imperialist institutions they defend. It was the most significant sign of the revolutionary militancy of the black working class for many years. Black people showed once again that they would not be the victims of racism, but the revolutionary fighters against their racist oppressors. Organised by the New Cross Massacre Action Committee the march was a militant response to the lies and distortions of the press, the inactivity of the police, the total indifference of Parliament and local Labour MP, John Silkin, to the massacre of 13 black children by fascist murderers. 15,000 people joined the march and their placards and slogans made their feelings clear: New Cross Massacre Cover Up; Forward to Freedom, Babylon will fall; No stopping us now we are on the move; No Rights, No Obligations. Timothy Raison, Secretary of State for Home Affairs, was met by a hundred-strong picket when he visited Oldham. Oldham's black community turned up in force chanting 'Death to Racism! Fight All Racist Attacks! Self-Defence the Only Way!' and 'Immigration Controls Out!'. Black people in Oldham live under a regime of police/racist terror. The mosque windows in Oldham are regularly broken and racist slogans painted up in the area, black people are beaten up by gangs of white youths. There have been numerous deportations. Police repression in Holloway has continued without mercy since the arrests of 20 local youths at the end of December. At the time a Homsey Road police thug said, 'We want the blacks off the streets for Christmas'. Not content with harassment of black people on the streets and in their homes, at the courts and in the prisons, the police have now carried their attacks into the schools. Readers can see from the letter printed on this page what happened on Monday 16 February at a North London school. The youth arrested were actually grabbed and beaten up in the school building itself. The letter which FRFI is pleased to publish was given to our supporters, who have been working regularly in the area, by youths from the school. We are impressed by the solidarity and determination of these youth to organise against police tyranny. They do not see why such actions should be carried out and kept secret from parents and the community as a whole. The school authorities know, the teachers know, so let the world know what can happen to black and working class youths in a London school. That is the message from 150 pupils. Three of the St Pauls 12 have been acquitted. In these three cases even the frame-up tactics of the British police and courts could not be made to stick. In the case of one of the acquitted defendants, the Judge was forced to admit that his name had not even been mentioned in the course of police 'evidence'. The remaining nine face the serious charge of 'joining in common cause to riot' which carries a heavy prison sentence. Of all the hundreds who rose up against police harassment, the state has chosen these nine to act as an example to all those who dare to rebel. On 18 January 1981 a fire deliberately started at a birthday party at 439 New Cross Road, South London, resulted in the cold blooded murder of 13 black children. Mrs Amza Ruddock, who held the birthday party for her 16 year old daughter, Yvonne, lost two children — Yvonne and Paul. Fight Racism! Fight Imperialism! extends its deepest sympathy and solidarity to the relatives and friends of the dead and injured. Those who died are Lillian Henry (16) Lloyd Hall (20) Patricia Johnstone (15) Jerry Francis (16) Steve Collins (17) Andrew Gooding (14) Humphrey Brown (18) Peter Campbell (18) Patrick Cummings (16) Owen Thompson (16) Glen Powell (16) Yvonne Ruddock (16) and Paul Ruddock (22). 29 other children were injured, some very severely. There is a long history of racist and fascist attacks on black people in South London. Within one mile radius of 439 New Cross Road, 4 places have been burned down in the last few years, and shortly before the massacre black people's cars in the area were burnt out by racists. Black people are therefore rightly convinced that the New Cross Massacre was another such murderous and deadly attack. Obscene letters have been received by relatives of the dead and injured gloating over the attack and stating that this is the first of many. One of the letters, received by Mrs Haynes, mother of one of the injured stated 'What a great day it was last Sunday when I heard about the fire and all those niggers going up in flames ...' The response of the black community to the massacre has therefore been a massive anger, shown by meetings of up to 1000 people. Two significant reports on race equality were published in October 2017: the government's first release of data from a Race Disparity Audit, which combines data from a wide range of central government departments; and the Runnymede Trust's Intersecting Inequalities: The impact of austerity on Black and Minority Ethnic women in the UK. TOM VICKERS reports.